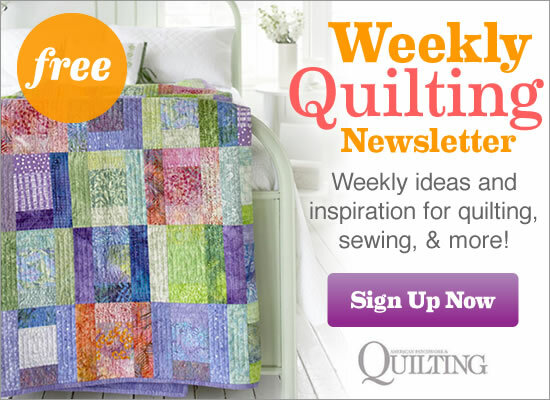 We know you love the quilt projects that appear in American Patchwork & Quilting® magazine. We took inspiration from projects in the magazine and created Web-exclusive versions, complete with full instructions as well as staff color options. Get the digital edition of this magazine. Piecing that mimics the look of latticework evokes the feel of an elegant English garden when combined with floral prints. Fabrics are from the Cinnamon Spice collection by Blackbird Designs for Moda Fabrics. Quilt tester Laura Boehnke took Garden Stroll to Italy. She replaced the pieced center of the original quilt with a novelty Italian map print, which makes an eye-catching focal point. The lattice-work look of the original quilt’s border blocks now mimic the look of crisscrossing streets. A mix of striped, polka dot, solid, chevron, and themed fabrics gives the piece a fresh, fun feel. The small squares of these prints pop against the white background. Go to the free quilt pattern. A blend of favorite stash fabrics plus a few newcomers turn into a delightful wall hanging. Executive editor Jennifer Keltner created this mix as her final exam during her Stash Rx lesson with designer Weeks Ringle. Adding in a textured cream print background lends some distinction to each of the bold, funky prints, giving them a chance to shine. See how Jennifer chose fabrics for this quilt here. Thin strips of hand-dyed, suede-look solids in beach-glass colors create a strikingly graphic throw of fine lines and visual texture. Fabrics are from Cherrywood Fabrics. If solids aren’t your style, don’t think you have to pass over Coast Lines. The design works equally well in the mix of assorted reds. A blend of florals, solids, and abstract and themed prints—including leaves, apples, and the alphabet—are warmed up by shared shades of red. The key to making the seemingly disparate fabrics work together is the black fabric, which mediates the mix. It’s a toss-up. Do the striations in this batik version remind you of the beautiful strata created in natural stones, such as Michigan’s Pictured Rocks? With amethyst-inspired horizontal breaks, it’s a palette Mother Nature would approve. Or do you picture it sideways, like the horizon during a magnificent sunset? Then the purple breaks appear almost to be backlit fence posts. Fabrics are from the Artisan Batiks: Patina Handpaints collection by Lunn Studios for Robert Kaufman Fabrics. A batch of hand-dyed wool and a dash of Japanese wovens blends beautifully in a small wall hanging. Whip up a background--a grid of cotton squares--from scratch, then add fusible wool appliqué. Transform the tulips into pop art with large-scale prints and high-contrast colors. Cutting the stems and leaves from solids helps them recede in the overall design. The canister shape was a bit too traditional for this fabric choice, so we modified it. The rounded shape in the border print’s tulips provided the inspiration for the new vase. Fabrics are from the Hello Gorgeous! collection by Melissa Ybarra of Iza Pearl Design for Windham Fabrics. Triangle-squares spinning in every direction surround a small medallion center. With few fabrics repeated, the circa 1880 quilt is a visual feast for fabric-lovers! You’ll have sunshine on a cloudy day with this cheery throw that features yellow bursting through black and gray. Geometric prints lend a modern feel to a traditional block and color combination. Fabrics are from the Eclipse Cotton & Tonga collection from Timeless Treasures Fabrics. Not every print is a star, but this color option proves an ensemble cast of mostly tone-on-ton prints can be a huge success. Beginning with a pair of leftover prints, this medley of scrappy triangle-squares becomes a striking table topper. The key to making this combo sparkle is deliberately alternating the placement of the gray-brown neutral across the quilt top, letting the brighter colors capture most of the attention. Designer: Victoria Findlay Wolfe of Bumble Beans, Inc.
You may see more work here than there really is! Fussy-cut stripes of all kinds--skinny, wide, and even chevron--make every part of this quilt, including binding, spectacular. Fabrics are assorted stripes and Cotton Couture solids from Michael Miller Fabrics. Jewel-tone blues, golds, and browns in subtle tone-on-tones create a rich wall hanging. Fussy-cutting striped fabric makes the Aster blocks pop. Fabrics are from the Renaissance Garden collection by Jinny Beyer for RJR Fabrics. Wonder what you’ll do with that marvelous print you picked up on vacation? Here’s the solution. Pack together a bevy of prints with a common coloration (ours was blue-and-white and red-and-white). The diversity of prints—including novelty, travel, paisley, floral, polka dots, and geometrics—is held together by the bright white in each. Subtle yet intentional contrast visually separates the pieces in an easy variation of the Attic Windows block. Simply add strips to two edges of a square, then set the resulting block on point. Fabrics are from the Victorian Modern collection by Modern Quilt Studio for Andover Fabrics. Bold girly prints stand out against red, black, white, and gray sashing for a high-impact wall hanging. Fabrics are from the Fashionista collection by Ro Gregg for Fabri-Quilt. An eclectic array of geometric and floral fabrics combines for a cozy quilt. Subtle similarities in saturation and levels and prints tie it together. The decorator’s rule of incorporating a color three times in a room (or in out case, a quilt) helps unite the prints. The brown tone-on-tone sashing creates a bridge that frames each print and prevents the prints from competing for attention. Color placement is the key to creating these sparkling stars in a patriotic palette. Fabrics are from the Gallery in Red and Blue collection by Faye Burgos for Marcus Fabrics. A playful palette of citrus colors—orange, green, and yellow—brings a summery look to this wall hanging. Careful placement of triangle-squares produces pairs of star blocks. Fabric are from the Mooshka collection by Julie Paschkis for In the Beginning Fabrics. So many patterns, so much fun! Who knew triangles could result in so many different looks. Color placement is key to this four-partial-block color option, too. Make only the center section of the original 36-triangle-square block and you’ll see an X emerge. We replaced the center Pinwheel with a square. Combining four blocks creates a fifth X where the blocks intersect. Fabrics are from the Vintage Dry Goods collection by Daiwabo for E.E. Schenck’s Cara Collection. The shapes created by joined rows reflect fine menswear finishing, such as bow ties and Argyle, making this pattern perfectly suited for a special guy. Fabrics are from the Freedom Rings collection by Paula Barnes for Marcus Fabrics. Red and turquoise combine beautifully in a wall hanging that features large floral prints and ample room for extensive quilting in spacious cream print setting squares. Fabrics are from Silvia’s Garden collection by Silvia Vassileva and the Terra collection, both for P&B Textiles. Give the pattern a twist to make a crib or wall-size quilt. Straight-set the blocks and alternate them with setting squares cut from a lively print. Are you thinking you have to follow the rule of choosing between batiks and quilting cottons? Guess again! Mixing cotton prints and batiks in quilts it all the rage. Fabrics are from the Pocket Full of Poppies collection by Kathy Davis for FreeSpirit and Bali Hand-Dyed Watercolors from Hoffman California Fabrics.